The Heart Sutra and the Crisis in Buddhist Philology. This is the 500th post on this blog. What appears here, over the 12 years or so since I was Ordained into the Triratna Buddhist Order in 2005, is a kind of intellectual diary or autobiography. It records what interested me, what I was learning about, and what I was thinking about. Here, one can see my haphazard development as a Buddhist intellectual over more than a decade of self-directed and self-taught study and research. Of course, this is not my whole life. There is little of my daily life, my practice of religious exercises, my artistic and musical explorations, or my friendships. I made a conscious decision to avoid this being a confessional blog after some bad experiences in earlier forays online. This blog is all about ideas. I have also published some writing and this, to some extent, outshines this self-published material, but this blog is what it is, and I'm content with it as it is. Thanks to everyone who ever read an essay, but especially to everyone who got in touch to say I made them think or articulated some intuition they had. That's what it's all about. My thanks to Ann 'Pema Yutso' Palomo for the original inspiration to start composing Buddhist "raves" a lifetime ago. A few weeks ago, I struggled through one of the dullest articles from Buddhist studies that I've ever read. It was long, pedestrian, and had nothing much to say, but it touched on something I've been working on so I had to persevere. Jonathan A. Silk's 2015 article on philology in JIABS could not be more of a contrast. Silk is incendiary in his approach to philology, burning to the ground many of the cherished assumptions of the field. After reading the article, I discovered that the text is from a conference paper delivered at Oxford University in 2013, a video of which is online. I recommend it, as Silk is a good presenter (which is rare amongst academics reading papers) and his topic is of great interest to anyone working with or interested in Buddhist texts. The reasons that academic writing and presentation are so bad is another subject entirely. I learned philology by reading examples of it, rather than systematically studying it under the guidance of a teacher. I'm fortunate that a few scholars have given me assistance when I've requested it, Jonathan Silk being one of them (he is an expert on the Heart Sutra in the Tibetan Kanjur). Since I met Richard Gombrich in 2006, while attending his Numata lectures at SOAS, his approach to philology and that of his friend and teacher, K. R. Norman, have been particularly influential. Reading the articles of Professors Norman and Gombrich was my education in Buddhist philology. Norman said that the philologer tells us not only what a text says, but why it says that (and not something else, he seems to imply). I've always tried to take this to heart. In this essay, I explore aspects of Silk's thesis on philology by looking at how it applies to the Heart Sutra, a text which exemplifies many of the problems he identifies. Silk and I are on the same wavelength on this. I have been coming around to some of the same conclusions, but without the expertise and clarity that he brings to the subject. Deciding what a text says, let alone what it means, is far more difficult that most people imagine. I've outlined some of the difficulties in my essay Is There Any Such Thing as 'a Text'? (20 December 2013). For example, every single manuscript and inscription of the Sanskrit Heart Sutra is different from the others. Mainly the differences are simple scribal errors, but most of the witnesses also suffer from cack-handed "editing". The late Nepalese manuscripts (18th - 19th Century) are so full of errors that they make no sense anymore. In 2014, I described a previously undocumented Heart Sutra text, containing more than 140 omissions, additions, and errors (using Conze's edition as a reference point). The execrable state of the Nepalese manuscripts is one reason that, since Max Müller first described them in the late 19th Century, the principal witnesses for the Heart Sutra have been the two manuscripts preserved in Japan (one of the short and one of the long text), particularly the so-called Hōryūji manuscript of the shorter Heart Sutra. However, even these, which probably date from the 8th or 9th Century, are problematic. They suffer from grammatical and scribal errors (i.e., spelling mistakes); as well as odd punctuation and some adventitious defilements. On the other hand, argues, Silk, such idiosyncrasies can be informative about the history of textual production. However, the question Silk raises is this: what is the reference point for making such comparisons? I used Conze's edition, but it was before I became thoroughly dissatisfied with it and with Conze's entire body of work on Prajñāpāramitā. The manuscript and epigraphical witnesses of the Heart Sutra give a confused testimony, just as a dozen witnesses to a crime will all recall different details and will disagree on many of them. Out of this chaos, Conze scraped together a text that is more or less coherent, but what is the relationship of his eclectic edition with any historical Buddhist community? Even taken at face value, there is no evidence that a Sanskrit text like Conze's ever existed before he created it in 1948. This is a problem for all eclectic editions of Indian texts, and most especially Buddhist texts. The value of eclectic editions lies in the assumptions we make about what they represent. Philologists take the possibility of recreating an ur-text from existing witnesses as axiomatic; the methods of doing so to be sound; and the results of these methods to be valuable. And Buddhists seem more than happy to accept the work of philologists at face value. But there is no objective reason to believe any of this. It is possible that we might identify common features of texts by comparing them, and we might conjecture about the immediate ancestor of the witnesses in hand. But that such a creation can be considered the ur-text is incredibly naive. We usually have no way of testing our conjectures. New archaeological finds often prove our conclusions wrong. And, in the case of the Sanskrit Heart Sutra, a number of errors have lurked in the text. Intense interest in the Heart Sutra has not translated into intense scrutiny of the text. In the case of the Heart Sutra, it is apparent that we do not have an ur-text or anything like it. Though claims are made for a Sanskrit ur-text, and for two of the Chinese short texts, i.e. T250 and T251, according to my understanding of standard philological methods, none of the three could be the direct ancestor of both the others. So the ur-text appears to be lost, and the confusion amongst the extant witnesses makes recovering it impossible. Philology, drawing on underlying assumptions of the Western intellectual tradition, assumes a singularity at the beginning of history. The norm is that a single author composed a "work", instantiated it as a fixed "document", and created a "text" in the form of manuscript or inscription (Cf. Silk 2015: 206). This original work is understood to be a pure representation of the author's thoughts. In this view of the pure "original", we are forced to see differences in contemporary witnesses as corruptions. This language is suspiciously reminiscent of the Old Testament, which is not a coincidence. Buddhist philologists inherited our methods and attitudes from European Biblical scholars. As they were dealing the word of God, the early philologists had a real problem with the variability of their manuscripts. It only got worse as they colonised the world and looted old Bible manuscripts, only to discover major differences from European received texts. That so much human error was apparent in the Bible was alarming for Christian scholars, to say the least. Their urgent task was to establish an authoritative version of the Bible, eliminating human error entirely, to reveal the words of God. They also had to hide the existence of this variability from an unsuspecting public, because what would people think if the Bible were revealed to be a human production? The Buddhist public is similarly insulated from the variability of Buddhist texts. Buddhists often speak of, for example, The Heart Sutra, as though it is a unitary document. But it isn't. News slowly leaks out of scholarly discoveries, but scholars are generally careful not to rock the religious boat and the pieces are seldom brought together in ways that would cast doubt on the established view (here I differ from my mentor Richard Gombrich, as he sees no reason to doubt the story that the Pāḷi texts tell about themselves, and I see every reason to doubt it). When Darwin was describing evolution, he chose a branching tree as the central metaphor for the process. He was of his time, focussed on describing how variety emerged by natural selection. Unfortunately, this was a poor choice, because, in both biological and textual evolution, hybridization is common. For example, in the last few years, we have discovered that all Homo sapiens outside of Africa have genes from Neanderthals, Denisovans, and some other, as yet unidentified species of human. Europeans, Asians and Americans are all hybrids, or in the vernacular, mongrels. A branching tree cannot show this, as it never recombines. Similarly, texts show every sign of different lines of evolution crossing over and influencing each other. That such influence is referred to as "contamination" is revealing of the attitude underlying the philological method. I have proposed (to the void) that we adopt the braided stream as our metaphor for evolution. Features such as tributaries, mainstream, side-streams, confluences, branching, recombining, ox-bow lakes, give us a much richer metaphor for dealing with the real world complexities of change over time. Fortunately, some biologists better placed for influence than I am are saying similar things (For some examples, see the notes at the end of my essay, Evolution: Trees and Braids). In the rest of this essay, I will offer some reflections on philology and the Heart Sutra under four headings: authenticity, authority, ownership, and aesthetics. To my mind, these issues are closely interrelated and thus not strictly separable. However, by taking each as a starting point for reflection, different aspects of the problems with Buddhist philology come into focus. Historical singularities are a myth. There may be a time when streams of events reach a confluence that is particularly influential, but they are never simple. This fact does not stop us from thinking of the past as simpler than the present. The obvious example for Buddhists is our myth of the founder of Buddhism, whose name we do not know, but who was later called Siddhartha Gautama, an archetypally Brahmin name. There are two quite contradictory stories about how he ended up leaving home to become a religious striver (śrāmaṇa). His dates are a matter of conjecture: Buddhist texts appear to have been composed sometime after ca. 700 BCE and considerably before ca. 250 CE, and the Buddha, if he lived, presumably predates the texts. The myth is that all Buddhist ideas and practices stem from this one man. But this is not true. For example, Norman, Gombrich, and others have shown that early Buddhist texts are full of technical terms, ideas, and practices adopted from Brahmins and Jainas. The early Buddhist texts are, like the Heart Sutra, largely constructed from stock passages, recycled many times over. Stories occur in several different versions, with changed characters, or a key term changed; or we see fragments of one story are combined with parts of other stories. Some stories or parts of stories are obviously drawn from a general pool of such stories shared with Jains and Brahmins. We also see that the language of the texts changes in a way that suggests progression over time (an important basis for the conjecture that some parts of Pāḷi Canon are older than others). The most likely conjecture is that the Buddhist literature went through an extended period as an oral literature (i.e., storytelling) lasting perhaps two or three centuries, before being edited en-masse and set down in writing (or, possibly, the other way around) in at least three different versions: Pāḷi, Gāndhārī, and possibly a distinct Prakrit Canon later translated into Sanskrit. Even if these structural features were not there to undermine the concept of the historical singularity, we have to consider the psychological reality of being human. Everyone is subject to conditioning as they grow up. We learn a mother tongue, family patterns of interacting, and the social mores of our community. No one is a blank slate. Despite the romantic myth, genius doesn't appear out of nowhere. Talent that goes unnurtured goes to waste. It used to be accepted that the Heart Sutra was a Sanskrit text, composed in India. Indeed, it was seen not only as authentic, but as the essence of other authentic texts. Conze placed it together with the so-called Diamond Sutra (vajra does not mean "diamond") in the mid 4th Century, representing a phase of contraction following a phase of expansion of the original Prajñāpāramitā text. In fact, that expansion never really stopped while Buddhism was a living religion in India. A number of scholars now consider the Vajracchedikā to be the same vintage as the Aṣṭasāhasrikā (8000). Then, in 1992, Jan Nattier showed beyond reasonable doubt that the Heart Sutra was composed in China from a couple of extracts from a translation of the Pañcaviṃśatisāhasrikā (25000) produced by Kumārajīva's group (T223) or perhaps their translation of the commentary (updeśa) on it (apocryphally) attributed to Nāgārjuna (T1509). To these extracts were added an introduction, itself drawing on the Prajñāpāramitā idiom found in Pañcaviṃśatisāhasrikā, and a shortened dhāraṇī based on one found in the Mahāmegha Sūtra. So, the provenance of the Heart Sutra is complicated. It has been assembled, rather than composed; and assembled in Chinese rather than in Sanskrit. Recent research has shown that Mahāyāna texts were composed in Prakrit and only began to be translated into Sanskrit during the Gupta Era (ca 3rd – 6th Centuries CE). Close attention to the transliterations of Indic words in the earliest Chinese translations shows that they were either in Prakrit or some Central Asian vernacular (of the Iranian branch of Indo-Iranian). In the last decade, a few more very early Gāndhārī manuscripts from caches in Pakistan and Afghanistan have been described, including a first Century CE manuscript of the Aṣṭasāhasrikā. Few, if any, sutras were originally composed in Sanskrit, though commentaries and other secondary literature were (although at this stage the distinction is moot). So, a Sanskrit text is not an indication of authenticity, it just means that a text was in use at a time when Sanskrit began to be widely used outside Brahmanical circles. We also know that Mahāyāna sutras were continuously changed, mostly expanded, over many centuries. A first Century Buddhist community in Gandhāra would have known the Aṣṭasāhasrikā as a mid length sutra in their local vernacular. An 8th Century Magadhan community might have used a Sanskrit translation of Pañcaviṃśatisāhasrikā, with no sense of it being either a translation or expanded. In China, where different versions of a work were recorded, the differences over time became apparent and caused some consternation as it appeared to them that earlier translators had abbreviated their translations. However, Chinese Buddhists also composed "sūtras", including the Heart Sutra. Can a sutra "composed" in China be considered authentically Buddhist? Or ,more precisely, can it be considered an authentic sutra, since presumably, any work about Buddhism composed by a Buddhist is de facto a Buddhist text. Or, does the authenticity lie in the quoted passage from the Pañcaviṃśatisāhasrikā, which was originally in Prakrit? I'm not sure how to resolve these questions from a philological point of view. Silk points out that an eclectic edition, such as those produced by Conze or Vaidya is not the same as an ur-text. An edition is not the original but is, in fact, a new work (2015: 211). In the case of the Sanskrit text, there is no evidence whatever that a version like Conze's edition was ever used by any ancient Buddhist, though it has been adopted by many modern Buddhists as the authentic Heart Sutra. But the fact is that it came into existence only in 1948. And Conze's edition, at least, has some errors in it (Nattier 1992, Attwood 2015). Meanwhile, eclectic editions produced by Müller, Conze, and Vaidya are all different from each other. They have not solved the problem of authenticity, just moved the bottleneck. For the Heart Sutra, the situation is particularly dire, because the Sanskrit version is revealed by recent scholarship to be a rather poor translation. Jan Nattier (1992) identified some poorly translated passages. Since then Huifeng (2014) and I (Attwood 2015, 2017) have independently identified several more. The translator seems to have misread the Chinese version and thus bungled the Sanskrit translation. Even where the rendering is accurate, the Sanskrit Heart Sutras are not consistent with the Sanskrit Prajñāpāramitā idiom, leading to some oddities. The situation is worse still since there are three versions of the Heart Sutra in the Chinese Tripiṭaka, i.e., T250, T251, and T256. All are different from each other. The earliest dated inscription is almost identical to T251, differing in only one character (used twice), though the substitute has the same phonetic and tonal value. Woncheuk's commentary suggests that at least one more Chinese version was circulating at the end of the 7th Century and that a Sanskrit text was consistent with it rather than with T251, but he made T251 the normative text for his audience. He may have been influenced in this by the commentary of his rival Kuījī who also used T251 as his text. The three canonical texts are traditionally considered to be translations from Sanskrit, but now we know that they are not translations and in each case the attribution to a particular translator is questionable. None of the three is an obvious source text for a putative Sanskrit "original". This suggests a missing Chinese mother text that underwent multiple parallel revisions resulting in the different daughter texts and was then lost. So, in fact, none of the versions of the Heart Sutra, and certainly not Conze's Sanskrit edition, can be considered "authentic" in the sense required by philology. And here we run into the limits of philology when dealing with religious texts. It gets a bit more interesting when we look at the situation from an anthropologist's point of view. In Chinese Buddhism, for example, T251 is the undisputed authentic Heart Sutra. Although other texts are preserved, it is only T251 that has ever been the subject of commentaries (since Kuījī and Woncheuk in the late 7th Century). In Japan, the authentic Heart Sutra is T251, written in Chinese, but pronounced according to Japanese conventions, making it incomprehensible in either language. In Tibetan Buddhism, by contrast, only the longer version was canonised and commented on, giving it the stronger claim to authenticity. Tibetan translations of the short text were found at Dunhuang (briefly ruled by a militaristic Tibetan empire) but none of them was incorporated into the Kanjur. Western Buddhists frequently recite the sutra in English translation, but there are dozens of different translations, each of which is seen as authentic within the context in which it was created. So from an anthropological point of view, the authenticity of the sutra is not a matter of reconstructed ur-texts or "originals", and this is not even (solely) a matter of putative original languages. The authentic Heart Sutra is simply the received text within a particular practice community, whatever form that may take. Since commentary on the text assumes that it doesn't make sense on face value, commentators are largely able to skate over the incomprehensible parts, though Thích Nhất Hạnh is a notable exception to this because he actually dares to change the text, a fact we'll revisit under the heading of ownership. A garbled text can still be authentic in this anthropological sense if it is the text that a community prefers and uses. Another example of this I have written about is the 100 Syllable Vajrasattva Mantra which is usually chanted in a garbled form. Despite being easily restored to classical Sanskrit, as it is found in the earliest textual source, there is considerable resistance to such restorations. Of course, a historian of ideas may wish to trace the development of a work as it changes over time, and it may be valuable to do so in that it gives us insights into the process of producing Buddhist texts. But one cannot really argue that any one version is more authentic than the others. Each community that uses a text defines what counts as authentic. This is not a recycling of post-modernist critical tropes, but an acknowledgement that the nature of the text in Buddhist literature is fluid; and that Buddhist communities are seldom interested in philology, even though they are very interested in the issue of authenticity. This situation is curious. I confess that I experience resistance to the idea that there is no authentic text, except in the locally defined sense, and no effective critique of the authenticity of a locally accepted text. The text is what it is, to the community who accept it; and it means just what they say it means (the Humpty-dumpty Principle). Which brings us to the issue of authority in relation to the Heart Sutra. The authority of a religious text has nothing to do with how true or factual the text is; nor even its virtues as literature, since the literary merit of most religious writing is minimal (and made worse by translation). This is particularly so in the case of Buddhist scripture, which is often highly stylised according to aesthetic and practical considerations relative to ancient North India. By modern standards, Buddhist sutras are repetitive, turgid, and stilted. This is not helped by translations that ape the archaic language of the King James Bible and which employ English vocabulary arranged according to Sanskrit syntax, aka Buddhist Hybrid English. Philology plays almost no role in the issue of authority in Buddhist communities. The authority of scripture comes from the collective agreement of people to treat it as authoritative. And that seems to be the extent of it. Of course, this seems insufficient to the philologist, but Buddhist communities just don't seem to care. They care more about respecting the author of a commentary than about the text. This is an aspect of the crisis in Buddhist philology. However, the text does play a role in humans' asserting their authority. For example, the text can be a tool for a person to assert a superior position in the hierarchy; or it can be a symbol of their superiority. Conze's commentary on the Heart Sutra is full of oblique references to his special insights into the meaning of the text, which he does not expect ordinary readers to understand. Conze set himself up as an authority on Prajñāpāramitā, outside of any community. Throughout his books on Prajñāpāramitā, Conze taunts his audience with their failure to understand the text. It is only decades later that we realise that Conze's work was very often shoddy and that his gnomic pronunciations on the text were more influenced by readings of German Idealist philosophy than by Buddhism. The irony is that, despite his still authoritative reputation in Buddhist circles, Conze is an unreliable guide to Prajñāpāramitā. Conze-ism is a very peculiar reading of Buddhism. Authority with respect to the Heart Sutra is part of a feedback loop: people seeking authority interpret the text and, in the process, the text becomes a symbol of authority. When enough people point to the sutra as embodying something important, then people treat it as important, even when they don't understand it (which almost no one does). Not being able to understand something associated with the exercise of authority (be it economic ideology, or scripture) is treated as a sign that it is profound (as opposed to difficult, complex, or wrong). Confusion produces awe, especially when a high-status individual tells us that they understand the thing that puzzles us and our peer group acknowledges their authority. See also what Dan Sperber calls "the guru effect". In terms of authority, it's not what you know, but who you know. Back in the 7th Century, two men were in direct competition to be the official successor of Xuanzang. Both wrote commentaries on the Heart Sutra. Kuījī went on to become famous as the co-founder, with Xuanzang, of a major Yogācāra based school of Chinese Buddhism. The other man, Woncheuk (a Korean), was passed over. It's likely that the Heart Sutra was a popular magic charm up to this point, written out and carried on the body to ward off misfortune. It is the commentaries themselves that establish the Heart Sutra as a text with a message. The source text for the Heart Sutra, i.e.,, Pañcaviṃśati (T223) and/or the commentary or Upadeśa (T1509), were important for Chinese Buddhism. The Udapdeśa was particularly seen as the most important interpretation of Prajñāpāramitā, partly because it was attributed to Nāgārjuna (again it's the person, not the text). Because the Heart Sutra is associated with Xuanzang it is considered weighty. Though T251 is attributed to Xuanzang, Nattier casts doubt on this. In fact, the evidence of Xuanzang's association with the text mostly seems to date from after his death. The Heart Sutra continues to play the role of magical protection (and this is also associated with Xuanzang), but it also becomes the essence of Prajñāpāramitā: a summary of the ineffable. People sometimes ask me which book on the Heart Sutra to read and I usually say "none of them". There is Mu Seong's imaginative, but wildly inaccurate work; or Kaz Tanahashi's recent elaborate pretension to "scholarship" in a language he cannot speak or read; or one can turn to Conze's grumpy elitist mysticism, which continues to be reprinted; or to the Dalai Lama's little book, which perpetuates his pose of being a "simple monk" offering simple wisdom. All are designed to flatter the reader and the author. I'll focus on Red Pine's "translation" and commentary since it is probably the most popular of these awful books. Pine trades on his reputation as a translator of Chinese texts. Here the translation is purportedly from Sanskrit, but Pine appears to struggle with the language and the English text is a mere paraphrase of Conze. He offers no real insights into the Sanskrit text and, worse, no comprehension of the context of the sutra beyond repeating some cliches that appear to originate with Conze. The commentary revisits the well-worn Zen absurdist approach to the sutra, popularised by Suzuki in the 1950s and 60s (which also forms the foundation of Conze's interpretation). Pine's folksy but ultimately vapid commentary is certainly popular. People seem to treat Pine as an authority on the Heart Sutra. However, as a work of philology, his book is worse than worthless, since it gives wrong information and misleads readers about the text. Almost every prominent Mahāyāna Buddhist clergyman since the 7th Century has composed a commentary on this text, though few rise above the level of a paraphrasing existing commentaries. The result is that we think of the sutra itself as authoritative, i.e., as possessing a human characteristic. The claim that the Heart Sutra communicates the "essence of the Dharma" is endlessly repeated. But, as far as I can tell, it doesn't. It really doesn't. It does give us some insight into the meditative state of emptiness or cessation. But it tells us nothing about "reality" or "transcendental wisdom" or how to practice. In a sea of irony, we can also point out that the understanding sought by mystically oriented Buddhists (concerned with, for example, knowledge of the true nature of reality) is said by them to be ineffable. This is insisted on by both the Buddhists and by many of the texts themselves. So to hold a text in such high esteem is itself paradoxical. Buddhist communities try to get around this by chanting it in a language or form which cannot be understood by that community, but it only reinforces the role of the exegete. If eclectic editions are not ur-texts, but simply new works in an ecology works created by various methods, amongst which recombination of existing elements is central; and if human communities, rather than any intrinsic feature of texts, determine authority, then the question of who owns a text arises. Who has the right to create a new text or alter an existing text? Despite more than 150 years passing since the first translation of the Heart Sutra into English by Rev. Samuel Beal (1865), philological scholarship made little progress until 1992 and Nattier's article. Twenty-five years later, a good deal of basic philology remains to be done, and few scholars seem interested in doing it. Working through the implications of Nattier's copious footnotes alone could have sparked a PhD or two, but her main thesis seems not to have drawn the kind of attention it deserves. There has been no radical reassessment of the landscape of Mahāyāna or Prajñāpārmitā in China. Dan Lusthaus and Huifeng have both raised concerns about Nattier's thesis. I've reviewed their efforts here and here respectively. Neither produces any serious objection to the Chinese origins hypothesis. The text repeatedly referred to as "the most popular text in Mahāyāna Buddhism" consistently fails to attract sustained attention from philologists. I believe the situation is somewhat different in Japan, but the majority of Japanese scholars publish only in Japanese, and very little of their output ever makes it into English. Nattier (1992) is clearly reliant on Japanese scholarship, but without proficiency in Japanese language (on top of Sanskrit and Chinese) a scholar is cut off from their efforts and insights. This seems unlikely to change anytime soon. Ironically the most popular Buddhist text is one of the least well studied and understood texts, not counting the hundreds that are entirely ignored. The context of the quoted sections is routinely ignored, for example (I have partially addressed this in Attwood 2015). There is, to the best of my knowledge, not a single study of the larger passage from Pañcaviṃśatisāhasrikā, of which the Heart Sutra uses perhaps a third (I hope to begin to address this in a forthcoming article). Wouldn't it make sense to see the quotation in context? Kuījī knew the text was a quote in the 7th Century, but more than a millennium later there is no comparative work on the source and quote. Perhaps the forthcoming publication of the Gilgit manuscripts of Pañcaviṃśatisāhasrikā will make a difference to this? On current form, it won't. The question of ownership seems to be complicated. For example, it seems that anyone can offer a new English translation of the Heart Sutra and they are not bound by any convention. One can change the way key technical terms are rendered, or one can interpolate at will to "clarify" the meaning of the text; one can arbitrarily punctuate the text and break the text into sections. There is a curious lack of constraint regarding translation, but quite a strong taboo on changing Sanskrit sources which are still widely seen as "original" and thus sacrosanct. In 2014, Vietnamese monk, Thích Nhất Hạnh, changed his popular English translation because he found a mistake in the Sanskrit (that he left intact). Meanwhile, Huifeng (2015) has pointed out that the Sanskrit translator has misunderstood his Chinese source text. Huifeng offers a new English translation of the Chinese, demonstrating the correct reading, but refrains from offering a better Sanskrit translation. I pressed him on this point by email and got nowhere. Despite being ungrammatical, unidiomatic, or incorrect, no one seems to believe that the Sanskrit text may be changed. I recently pointed out that the Sanskrit translator has misunderstood the characters 明咒 (Attwood 2017) and have proposed that the Sanskrit be amended to vidyā. Interestingly I sent my article to a prominent web-based translator of Chinese texts who dismissed it out of hand and insisted that he would retain the wrong translation. Tradition always trumps philology. It may be that this reluctance is related to a reluctance to accept Nattier's argument. After all, the conclusion is that the Heart Sutra is what philologists call "apocryphal". I'm not sure the term has much meaning in Mahāyāna Buddhism, though of course, some Mahāyānists do believe that their sutras were literally spoken by the Buddha. All Mahāyāna texts are apocryphal in that they were composed centuries after the putative lifetime of the Buddha and contain many innovations which have no precedent in early Buddhist texts. The popular books which mention Nattier's article appear to struggle with it. Red Pine proposes that there is another Pañcaviṃśatisāhasrikā, now lost, which is not in the usual Sanskrit Prajñāpārmitā idiom and that this imaginary lost manuscript is the "original" from which the Heart Sutra is created. Tanahashi says that he accepts the thesis, but then carries on as though he has not even read the section on the attribution of the Chinese texts to Kumārajīva and Xuanzang. Anyone can create an English translation, but the Sanskrit is "sacred". A philologist is allowed to create a new edition as long as they maintain the fiction that they are reconstituting "the original". Editions gain the inviolable status of "the original". People still talk about the Sanskrit original of the Heart Sutra. In 2012, I noticed that Conze made a simple grammatical error in his 1948 edition of the sutra (retained in subsequent revisions in 1967, 1973). It took me three years to research and publish the solution (Attwood 2015). In short, Conze mistakenly read the historical present verb vyavalokayati sma as intransitive (lacking a patient) and read pañcaskandhāṃs (accusative plural, the patient of the verb) as pañcasakandhās (nominative plural, agent). Conze tried to smooth over the resulting lumps using punctuation. The result is weird. Anyone familiar with Sanskrit ought to have seen that Avalokiteśvara was the agent of all three verbs in the sentence and that he was examining the five branches of experience (vyavalokayati sma pañcaskandhāṃs). This correction brings the Sanskrit in line with the Chinese versions and allows for the removal of all punctuation since phrase boundaries within the sentence are clearly marked. In the 67 years before I corrected Conze's mistake, at least a dozen top Buddhist studies scholars, including a number of experts in Sanskrit (including my scholar-hero Nattier), had commented on the Sanskrit text and offered translations. Red Pine built a reputation as an authoritative scholar on the basis of his "translation". But none of them questioned why the first sentence could not be parsed. Note that my 2015 article has yet to be cited by anyone, which presumably means that most people interested in the Sanskrit Heart Sutra have yet to get the news. Why is the Sanskrit text, even in the form of newly generated editions, inviolable? The huge variability in the manuscript bears stark witness to the fact that the text has been changed in the past. But most punters never have any contact with the manuscripts (If you want some click here). In fact, the Prajñāpāramitā literature was frequently altered by editors, some of whom seem quite inept. All the pre-Tantric prose texts (the texts with numbers in their titles, as well as Vajracchedikā) grew over time. The fetish for fixing Mahāyāna texts in a Canon was something that developed in China and then Tibet. There is a contrast here with Pāḷi texts which were canonised quite early on. There really is no historical rationale for not changing a Mahāyāna text if we find a mistake. Mistakes were made. Part of what Silk is saying in his article on the failings of philologists is that texts are rooted in communities. If some Japanese Zen practitioners chant T251 (the Chinese text attributed to Xuanzang), in a Japanese pronunciation that is not comprehensible either as Japanese or as Chinese, and they feel it has meaning for them, it's not for us to judge. This is an anthropological view. The philologist is focused on what texts say and why they say that, but the anthropologist is interested in questions such as how chanting the incomprehensible scripture affects the behaviour of the community, how it enacts their values, and how it helps them to create a shared identity. And if each community, in time and space, uses a different version of the same scripture it doesn't really matter. The scripture that a community uses is the authentic and authoritative text for that community. the text is congruent with liberal values. This may help explain the reluctance to improve Sanskrit texts by correcting errors. An extant Sanskrit text has an intrinsic value for Western Buddhists (as long as what it says can be interpreted as supporting liberal Western values). It may be that here we see the influence of Protestantism with its cult of the book. Certainly, we are taught to see Sanskrit as the "original" language of the sutras. Not all Buddhists directly buy into the Indian superstitions surrounding Sanskrit as the "perfect language", but this attitude may be an influence. Learning Sanskrit is a fairly major undertaking that few Buddhists are willing to commit to. Indeed, few translators of the Sanskrit Heart Sutra seem to be willing to commit to it, either. The fact that one cannot read the "original", and the taboo around Sanskrit texts, help to intensify the aura of mystery; and, I would argue, the submission to authority that characterises our communities. If this section of the essay seems a bit disconnected, it's probably because I struggle to make sense of the complex situation. In fact, I think the situation is bizarre. Some days I think it is hilarious. There is no rhyme or reason to the different attitudes to the Heart Sutra. Philologists seem uninterested in the text as philologists, and unwilling to engage with any philological problems that are identified, even if they themselves identify the problems! Meanwhile, Buddhists churn out translations and mystical commentaries with increasing frequency (accelerated by Tibetan Lamas joining the Zen bandwagon). One can do anything at all to the text in English; but the Sanskrit translation is taboo, even though the Sanskrit text people think of as "original" was created in 1948 by Conze whose methods and results leave a lot to be desired; and even though the original Sanskrit translation from Chinese appears to be have produced by a bungler. How does one make sense of any of this? The range of tribal values and attitudes that inform the approach to this text is impossibly broad and contradictory. I don't think the Heart Sutra contains paradoxes, but the way Buddhists and scholars relate to it does seem to involve paradoxes. There is no conclusion here, but lastly, I want to move on to consider some aesthetic issues involving the Heart Sutra. In Austin and Searle's work on speech acts they make an interesting distinction between what you say (locution), what you mean (illocution), and what your audience understand (perlocution). There is no necessary relationship between the three aspects of speech. It is vital to know this in England, where what a person says is frequently unrelated to what they mean. Some days it seems as though everyone in the country is being sarcastic all the time. The famed English politeness is often a trojan horse. A polite English person may well be expressing contempt for someone of perceived higher or lower status. For example, using the title "Sir" is very often an expression of contempt rather than deference. I'm sure all societies have varieties of this and I suffer from being a cultural (though not genetic) immigrant, but I want to highlight these kinds of differences when considering the Heart Sutra from an aesthetic point of view. It's quite likely that at the start of its life, the point of the Heart Sutra was apotropaic magic, i.e., for the purpose of warding off evil. Medieval Chinese Buddhists would have the text copied, roll it up, and wear it about their person. Or someone with more money would have it carved onto a "dhāraṇī pillar"—an octagonal pillar of stone, with a pagoda-like 'hat' on top—and placed at a strategic place to prevent evil spirits from intruding. Xuanzang is supposed to have chanted it to scare off demons in the Gobi desert on his way to India. Curiously, this is the only time the Heart Sutra is mentioned in his memoir and I suspect it was inserted later to cement a relationship between the two of them by someone seeking to further legitimise the apocryphal sutra after his death. Unfortunately, for a long time dhāraṇī was seen in the context of Vajrayāna as a type of mantra, and thus in the province of tantric Buddhism. The confusion over the translation of the character 咒 (incantation, dhāraṇī or mantra ,depending on time-frame) has not helped this. Until the invention of Tantric Buddhism and its introduction to China in the later 7th Century, i.e., for some hundreds of years prior to that, dhāraṇī were chanted mainly as magical protection along the same lines as the Theravāda practice of reciting certain suttas as protection (parittā). This has nothing to do with tantra, and teleological approaches which treat dhāraṇī as "proto-tantra" miss the point. Dhāraṇī recitation and copying is an important Mahāyāna practice in its own right, though until the last ten years or so it has received almost no scholarly attention as such until Paul Copp's book The Body Incantatory. Dhāraṇī operates in an entirely different aesthetic to mantra. On the other hand, as early as the late 7th Century (the precise dates are unclear), commentaries were composed commenting on the Heart Sutra as a doctrinal text. The first commentaries were by Yogācārins, both students of Xuanzang. Kuījī acknowledges that there is a Madhyamaka reading of the Heart Sutra, but his commentary asserts his own Yogācāra interpretation as superior. This view of Yogācāra as superior to, and partially superseding Madhyamaka, became common in East Asian Buddhism (it finds its way into the doctrines of Kūkai in early 9th Century Japan, for example). The sutra continues to play a dual role: a magical ward and a written record of ineffable doctrine, though members of different sects all see it as demonstrating their own sectarian doctrine. In the sense of a speech act, the illocutionary force of chanting the text is ambiguous, especially in the light of the sutra typically being chanted in a way that obscures the words, e.g., chanting it in a language the devotee does not speak. One of the special qualities of this text is that the devotee need not understand it for the "power" of the text to be effective. I've met people who claim to have had profound shifts in their consciousness on hearing the Heart Sutra for the first time - usually in Sanskrit (which usually means Conze's flawed edition). Chanting the sutra, in whatever form, retains a certain magical quality. Buddhism has this flavour of magical wish fulfilment throughout - though the "wish-fulfilling gem" is a Mahāyāna invention. Many of the extant Indian manuscripts seem to have been created, not for reading, but as objet d'art, or even as objects of worship, placed on shrines and offered flowers, candles, and incense rather than read or studied. Tibetan Buddhists have made a fetish of not allowing a book to touch the ground for example - or the proxy of the ground in the form of the floor of a house. I once attended a Tibetan puja at someone's house. Seated cross-legged on a cushion on a mat, I put the puja text on the carpet in front of me. One of the members, without saying anything, came and placed a cushion under it. It was never explained to me what was going on and I didn't ask. The carpet seemed clean enough to me and it certainly was not the "ground" as houses in New Zealand tend to sit on piles that elevate them above the ground. I can only suppose that it was related to the old Indian superstition of the feet being taboo. And yet, contrarily, the apparent meaning of the text—the ineffable meaning— is considered to be vitally important and so the text is assiduously studied by generation after generation of Buddhist acolytes. Dozens of commentaries have been composed in dozens of languages. Typically, alongside chanting an incomprehensible version of the text, students of Mahāyāna will also study commentaries of the text in their own language. So, for example, Westerners will chant the text in Sanskrit or Chinese, but study an English language commentary by a famous Buddhist such as Thích Nhất Hạnh or the Dalai Lama. Chanting is magic, but apparently one must also try to understand a text that it is claimed defies understanding. Most teachers are more circumspect in explaining the inexplicable than Conze, in that they don't gloat about their superior insights. All of the commentaries I have seen quietly resort to hand-waving and misdirection when it comes to explaining "form is emptiness". The little books on the Heart Sutra also flatter the reader with simplistic explanations that are comprehensible. With practice, the reader can reproduce such interpretations so that they appear to understand the ineffable - at least well enough to win an argument. On the other hand, no one really seems to explain why the positive identity (form is emptiness) logically implies the negation of, for example, the Four Noble Truths. If "form is emptiness" then the Four Noble Truths are naturally affirmed rather than negated. I think, however, that Buddhists get a little frisson of excitement seeing their central doctrine being dismissed. They assume that it must be very profound, indeed. Yet, if someone outside Buddhism was to simply deny the Four Noble Truths, no doubt they would defend them to the hilt. Here again, I struggle. Because, from a philological point of view, most commentary on the Heart Sutra is worthless or positively deleterious to understanding. And yet a "teacher" with a very tenuous grasp of Sanskrit who produces a flaky commentary of minimal literary or intellectual merit, may nevertheless have succeeded according to the aesthetic criteria of their sect. Commentators such as Red Pine or Mu Seong, seem to me to badly mislead their readership, but are still highly popular and even revered for their efforts. And my efforts to point out their mistakes are treated with scorn and derision. As someone with a great interest in philology, I struggle with an aesthetic sensibility which raises an error to the status of a profound truth, and in which a correction is resisted often with considerable hostility. The tension between philological and anthropological approaches to the text cannot easily be resolved because they are expressions of quite different values. But the tensions between these two outsider (etic) viewpoints are as nothing to the conflict of either with insider (emic) views. The anthropologist seeks to understand the insider on their own terms, but also to analyse those terms dispassionately, i.e., not accepting those terms. They study the emic view but retain an etic overview, relating their observations to some theory of human culture for example. The insider simply accepts the terms, hook, line, and sinker. In return, they gain acceptance to the group with all of the benefits membership bestows (or ought to). In a sense, acceptance is the key human value. Acceptance is primal. Foucault pointed out that we willingly subject ourselves to power, willingly make ourselves into subjects, in return for membership. That power in human relationship does not force people to accept the situation, that we, ourselves, make it happen. We are not the victims of power, we actively participate in power-relations, whether we are high-status or low-status. This is far more obvious in other primates with their simpler lifestyles. One need only read Jane Goodall or Frans de Waal to see what primate societies are like and how we are very like them in many respects (though different as well). Is there really a crisis in Buddhist philology? In fact, despite Jonathan Silk's effort to provoke a crisis (and my own modest contribution), if one looks at the Buddhist Studies literature, it is very much business as usual. Philologists continue to churn out critical editions and studies of texts based on such editions. They still construct phylogenetic trees or stemma to illustrate how the texts are related to each other. However, in order to attract funding and meet artificial objectives, they study more and more obscure texts. Many of the new studies are on texts I've never heard of and that seem to have very little historical interest. The movement of research in the field of Buddhist studies can be glacial. Knowledge progresses over decades, if at all. There are very few exciting new developments or paradigm changing articles. Nattier's article on the Heart Sutra is still treated as provisional after 25 years, and very few people have paid it any critical attention. It has not provoked a flurry of follow-up articles. It has not changed minds. Silk himself (2013, 2015) still refers to the Chinese Heart Sutra as a translation from Sanskrit. In the meantime, Silk has launched The Open Philology Project to explore more dynamic ways of presenting texts that are more consistent with the reality of Buddhist texts. It will run over five years and hopefully produce some innovations in how philologists deal with Buddhist texts. In reality, there is no crisis, but there should be one. The Heart Sutra illustrates this need, because it cannot be contained or understood within the current philological paradigm. The very idea of an ur-text crumbles. The values by which we judge the worth of the Heart Sutra cover such broad ground that even the metaphor of a spectrum doesn't cover it. I've suggested the image of a braided stream, but in fact, a riot might be more appropriate in this case. The different starting points for discussing philology and the Heart Sutra—authenticity, authority, ownership, and aesthetics—give a broad picture, but it is an abstract expressionist picture. The Heart Sutra is an enigma, not for the reason people think, but because of the reactions it provokes: from mystical fascination to studied indifference; from magical thinking to serious (though dead-end) philosophy. The Heart Sutra has a way of reflecting the views that people take to it. It is both tabula rasa and carte blanche. Even if Buddhist philology has the decency to have a crisis, I don't think that will have any effect on most Buddhist communities. They demonstrably operate under a very different set of values when it comes to texts. Despite being almost entirely dependent on the preservation and translation efforts of scholars, people interested in the Heart Sutra maintain a rather grim contempt for intellectuals. If anything, the crisis in conservative Buddhist establishments is social and related to the general decline of organised religions. They are content with medieval philosophy and resent intellectuals poking their noses in. If anything, philosophers are counter-revolutionaries, who tend to abandon their critical thinking when approaching medieval Indian "philosophy" and go native. I've seen many modern attempts to get to grips with Nāgārjuna's method, with apparent relish of the experience of confusion. I have yet to come across a single published attempt to identify, let alone assess the validity of, the axioms that Nāgārjuna takes for granted. As far as I can see, some of them are demonstrably false, and that undermines the whole enterprise. It is 25 years since Jan Nattier exposed the flaws in the received tradition about the history of Heart Sutra. In what is probably the best Buddhist Studies article ever written, she methodically works through the main thesis as well as a host of secondary issues with admirable clarity and thoroughness. Despite the comprehensive nature of her argument, Nattier left open a number of questions that have subsequently been largely ignored. In our three long articles, Huifeng and I have barely scratched the surface. I hope to get another long article published before the end of 2017 and have two shorter articles in mind. I no longer think we will find interesting answers to important questions in ancient texts. They are fun to explore and I have been enriched by learning the languages, but pragmatically the future is ahead of us and the Iron Age has little to say about our problems. We cannot keep reinterpreting ancient texts and, in any case, the Buddhist establishment has little interest in new interpretations. Those developing secular applications of Buddhist techniques have little or no interest in the Buddhist superstructure of ancient ideas. Buddhist Studies as a scholarly field has resolutely avoided any confrontation with Buddhism (especially over axioms) and, as the field is increasingly funded by Buddhists, and staffed by Buddhist monks, the situation is probably only going to get worse. "... if we wish to come to terms with Buddhist scriptures, their forms and their authorship, if we wish to think critically about establishing texts, how to interpret texts and how to translate them, there are deep, deep waters into which we must plunge, thinking about and considering issues of authority, of ownership, of intension [sic], of our place in the long... transmission of this literature (2015: 223). Arboresence. Jayarava's Apostrophes. (19 Jan 2017). In the first two parts of this essay I set up a scenario. I made a case for a mind-independent world, arguing that it is consistent with scientific knowledge and not inconsistent with early Buddhism. This dual approach hints at the overall purpose of the essay. I also tried to stress that I don't think we can project the human desire for perfection onto the mind-independent world, so that referring to it as Transcendental, Absolute, or even fair, is not warranted. The idea of an ordered universe is compelling; but why should it be ordered according to human standards? In fact, it isn't. Humans are only important to humans. An important and ongoing intellectual task is to identify the myths linked to such desires—just-world, perfect world, afterlife, immortality, supernatural, etc.—and reclaim them as human desires rather than as properties of the kosmos, per se. The world isn't like that, but we are. On a practical level, if we acknowledge our desires, we can figure out which are achievable and organise things as best we can to achieve them. It's not like fairness is a crazy idea, for humans. Having established that there is a mind-independent world and that it is neutral with respect to our values, I tried to locate humans wholly within that world. Just because the world is independent of my mind, from my perspective, does not require that there is an ontological distinction between mind and world. There is an epistemological distinction due to the channels by which we gain knowledge. We tend to conflate the classic five physical senses (sight, hearing, smell, taste, and touch) as providing us with information about the world and treat our mind-sense, that part of our mental activity which brings sensations and inferences to our attention, as providing a completely different form of information. Early Buddhists by contrast placed the mind-sense in the same category as the classic set of five senses. The opening question of Part 1 was whether my experience was real or an illusion. I've been researching the history of the phrases from the Heart Sutra that begin "form is emptiness" (rūpam śūnyatā). These were, originally, a reference to that familiar Buddhist simile, "form is like an illusion (rūpam māyopamaṃ). There are two ways of looking at the skandhas: they can be seen as categories into which all phenomena—mental and physical—can be slotted; i.e., the skandhas encompass everything and are an ontology or a theory of existence. In some views, this totality (sarvam) is real and in others it is unreal, an illusion. The middle way is to say that this totality is neither real nor unreal, but because it is contingent and ephemeral, it is like an illusion. Alternatively, the skandhas can be seen as the apparatus of experience or the experiencing apparatus and are concerned only with experience (i.e., with mental phenomena). In this case, the metaphysical question about real/unreal doesn't arise. Experience per se is like an illusion, because (in Western terms) it's all just representations in our heads. Experience is virtual - not real, not unreal. In this case the skandhas are not an ontology, but an epistemology; a theory of knowledge or of how we produce knowledge. What does this account of experience and a neutral mind-independent world gain us? Why insist on the epistemological nature of Buddhist insight, e.g., that the skandhas are experience? The reason is compatibility. And hence the title of the essay. Traditional Buddhism—e.g., the skandhas as ontology—is incompatible with what we currently know about the world. This can hardly be a surprise, since Buddhist ideas originate in Iron Age North India and are developed in a number of medieval Asian contexts. Very little knowledge about the world from these periods (ca. 500 BCE to 1800 CE) is considered accurate or reliable any more. During the last 400 years in Europe and its imperialist enclaves around the world, we have discovered a great deal about the value neutral, mind-independent world. In 2003/4, Cambridge Buddhists went to India on pilgrimage to walk in the footsteps of the Buddha. Right here in Cambridge many of the giants of the Enlightenment have studied, lived, and worked. Not figures of myth, but genuine historical people such as Newton, Rutherford, Darwin, Krebs, Crick, Maxwell, Eddington, Turing, Goodall... to name a few personal favourites. People whose ideas helped me to make sense of my world. Hundreds of other luminaries across the entire spectrum of human knowledge (and folly) lived and worked just down the hill from here. Why go to India? A lot of Buddhists, especially Buddhists I know, are powerfully influenced by Romanticism. As such, they can be carelessly dismissive of the European Enlightenment; some of them, rather ironically, use the internet to devalue science and technology. They seemingly forget that, though the Enlightenment did go down some culs de sac from time to time, it did a huge amount of good. For example, the Enlightenment effectively broke the power of the church over all our lives. It extracted concessions for ordinary people in the form of basic freedoms and rights for the first time. Nor did these freedoms exist in any Buddhist country, where totalitarianism was the norm. Power shifted away from ecclesiastical hierarchies to democratic institutions. As new, more reliable ideas began to emerge, superstitions lost their grip on our lives, particularly the big superstition, God. Nietzsche announced the death of God, but it was the great figures of the Enlightenment who killed him. And a good job that was. The Roman Church and its Protestant spin-offs subjugated the people of Europe and the people conquered by Europe for more than a millennium. But things were no better in Asia or India. Buddhist nation states routinely denied citizens basic rights and freedoms; they substituted the kinds of religious ideologies that made subjects content to be subjects. The idea of karma was used to undermine Buddhists' sense of agency in the present, by insisting that what is happening now is a fate predetermined by how we lived our previous lives. We need to be clear that traditional Buddhism seeks to turn back the clock and take us back to a medieval worldview. The risk with this is that we relinquish the basic freedoms wrested from the church and put an ecclesiastical hierarchy back in charge. The level of sycophantic deference directed towards "venerable" monastics suggests that many Buddhists are all too willing to be subjugated by them. Just as it's important to resist the rise of the far-right in France, the "moral majority" in the USA, and the right-wing nationalists in the UK or India, we have to recognise the regressive and backwards social and political organisation associated with Buddhist nation states and Buddhist monasticism. What I hope to show is that there is a middle way between embracing the intellectual slavery of religious ideology and the complete, nihilistic rejection of Buddhism. In other words, acknowledging the kind of world we live in, both in a physical and political sense, I want to show that we can easily imagine a Buddhism which is compatible with the modern world, but still worthy of the name "Buddhism". The account of Buddhism as concerned with epistemology is consistent not only with key features of early Buddhist and Prajñāpāramitā accounts of experience, but also with a number of post-Enlightenment accounts. On the Buddhist side, I associate the ideas most strongly with Sue Hamilton but, for example, Bhikkhu Bodhi has also commented that the world with which the Buddha's teachings are concerned is the world of experience. It is also a view that seems to resonate with those people I personally know who have made most progress with meditation and insight, though not always with the people who have adopted so-called "direct pointing" methods, with whom I am still out of step. The latter still seem to believe that they have discovered "reality" in their experience, and while this is an understandable mistake, it is a mistake and only sets back the project of modernising Buddhism. My approach does undermine those streams of Buddhism which purport to be about reality or metaphysics. Buddhism has nothing of interest to say on matters of existence, causality, space, or time. Nor does any religion. Buddhists may have a major contribution to make on the nature of experience and on the role of the first-person perspective in organising experience, but only if we can disentangle it from our narratives about "reality". Buddhism as ontology is not compatible with what we know about the value-neutral, mind-independent world. When some Buddhists assert that the mind creates the world in the sense that "mind precedes matter", they are clearly at odds with most of philosophy and all of science. Those Buddhists are asserting a form of causality for which there is no evidence, and which appears to go in the opposite direction to "reality". Worse, Buddhist narratives about reality are not even supportable on their own terms (as I have been pointing out for some years now in considerable detail on this blog). When they come into contact with modern methods and knowledge, these narratives cannot compete, except where people positively want magical explanations and are thus willing to be fooled (and I know plenty of people like this). However, if we interpret "world" as the early Buddhists texts clearly did, as "world of experience", then yes, the mind does create that world or, at the very least, is a central element in creating that world. (Note, it's not that Buddhist texts lack a social world, or a physical world. In fact, they use the word loka for all three. But the world we gain insight into is specifically the world of experience). This epistemological account of Buddhism is compatible with basic, macroscopic laws of nature because it says nothing about them and nothing that is at odds with them. There are other accounts of Buddhism which have similar compatibility. This is not a monolithic argument for Jayarava-ism. It's a general argument in favour of compatibility, using my ideas as an example of a compatible account. When we confuse experience and reality, then the result is usually inconsistent with laws of nature, because the contents of our minds, as virtual representations, are not constrained the same way that physical objects are (I illustrated this in Part 2 using the image of pigs with wings). When we correctly distinguish experience and reality, then we gain some wriggle room. Unfortunately for Buddhism, science is very accurate when it comes to the human scale physical world. At the scales of length, mass, and energy that we work with in our daily lives and which our naked senses can take in, science makes predictions far more accurate than our ability to perceive them, and in some cases more accurate than our ability to measure them at all. we gain an accommodation with science as the leading knowledge system of any time or place by stepping out of its way. Taken together, I submit that these two factors make a compelling case for adapting Buddhism towards an epistemological reading. This is the essence of what I wanted to say with this essay. So the reader could stop at this point. In what follows, I try to characterise in more detail the situation we Buddhists face in the modern world. Some years ago I was obsessed with the environmental art of Andy Goldsworthy. I emulated his efforts, often using discarded objects to create ephemeral sculptures. I began making freestanding arches out of whatever was at hand. A big feature of my four month ordination retreat was using my spare time to create arches from the abundant local stone (some pics here). I also got into making tall thin spires of stone, but I want to focus here on arches. A stone has certain properties: rigidity, density, external texture, colour, etc. The stone I was working with was weathered from surrounding cliffs. Individual stones tended to be fairly flat and had a rough texture. Now, a simple pile of stones does not have rigidity as a property, it is less dense than the stones that make it up, and doesn't really cohere into an object. It's more of an aggregate. 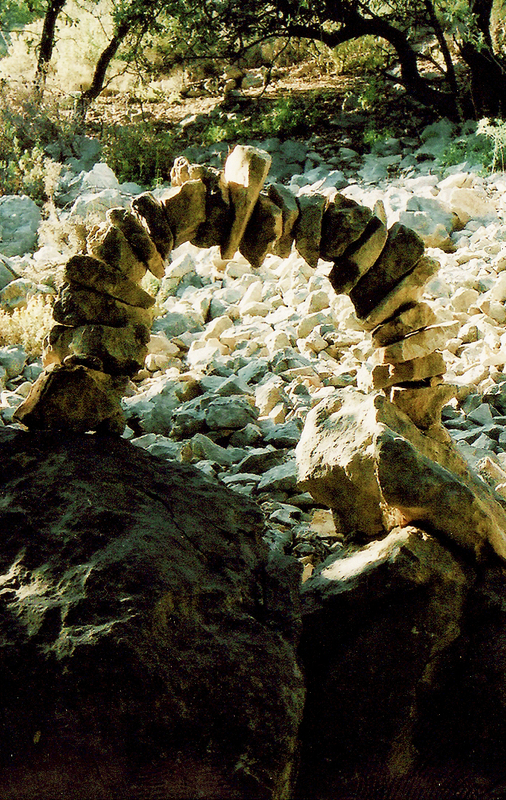 When you make an arch you create something more than a pile of stones. You create a new kind of entity that has properties that piles of stones don't have. Archs are structures with emergent properties. My method was to erect two towers of stones that curved toward each other until there was a final gap that could be plugged by one more stone - the keystone in arch-making jargon. Up to that point neither tower would be capable of supporting itself, but relied on a substructure to hold it up. Inserting the keystone to complete the arc feels a bit like an act of magic (I know). The two unstable structures become one structure that is stable, there is a palpable shift in the distribution of forces as two things that feel inherent unstable, become one that is stable. The best arches are lifted off their support a little by wedging in the keystone, so that the arch is already free-standing at that point. No investigation of the properties of the stones would throw up the possibility of making arches if one did not already have the idea of an arch as a structure in your head. The building blocks do not enable us to predict the architecture. This is the fundamental limitation on reductionism with respect to structure. On the other hand, one can analyse arches to see how the properties of the stones, assembled in a particular way, create the new property that enables the freestanding arches to remain standing. The basic principles of arch-making are old. The Romans were already experts at making them. The physics is all quite well understood and can be described in classical terms. Cambridge and the surrounding area are home to some spectacular medieval architecture. 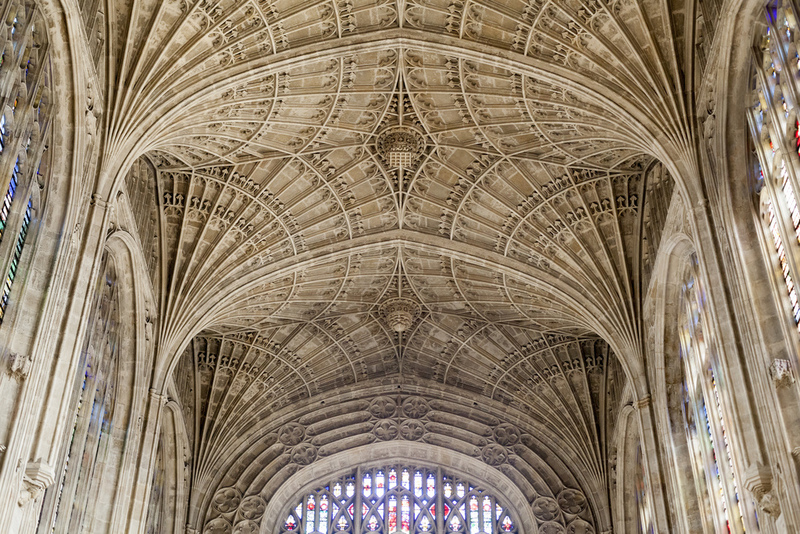 The fan-vaulted ceiling of King's College Chapel is an apotheosis of the architectural arch. The Norman cathedral at Ely is a classic of the type and full of spectacular arches and a dome. However, these days we have pre-stressed, reinforced concrete, steel beams, lightweight metal-alloy cladding, and toughened glass. It's nowhere near as aesthetically pleasing, but to some extent it democratised grand spaces. Architecture tells us a lot about a society. For example, the periods of self-indulgent monumental architecture in Britain, associated with the Normans and later with the British Empire, were signs of the accumulation of wealth in the hands of a tiny ruling elite at the expense of both British workers and the indigenous people of the various colonies. During the height of the Empire, for example, typical housing for working people was rows of tiny, small-roomed houses, crammed together; built at minimal cost, with the cheapest materials, and little or no decoration. Walls were thin, the houses were not insulated, and many had little or no garden space. Socialising in such houses was next to impossible, so this was done at the local pub for adults, or out in the street for children (weather permitting). Meanwhile, the bourgeoisie were building a network of country mansions, each with vast landscaped gardens, and a staff of peasants, many of these establishments on what was once common land, previously owned by no one but used by peasants as back-up for when work dried up. The huge dome of St Paul's Cathedral in London represents, as much as anything, the cruel inequality of British society, and the avarice of the Church of England at the time. You also learn a lot about British society by noting that the statues lining the walls inside the cathedral are mostly military figures, rather than saints. The role of the military is to protect commerce. We need to be clear that the meeting of Buddhism and modernism is not like two leaning towers of blocks coming together with only the keystone missing to join them into one harmonious whole. No. While Buddhists are hunting around for just the right keystone to complete the arch from the ancient past to the present, secular modernists have already just dropped a couple of massive steel beams across the gap, bypassing our religion entirely. Mindfulness is already a secular commodity and enlightenment is about to become one (Look up Jeffery A Martin for one version of how this might look, complete with hi-tech gadgets). Once people realise that they can have the enlightenment experience without the burden of memorising a bunch of words in a dead language, a load of ancient Indian myths, some rather doubtful "history", and incoherent ancient philosophical speculations, then "Buddhism" is going to become an even more niche activity; a theme park attraction or a Asian fetish. Like most people, while I do appreciate the elitist grandeur of the Norman Cathedral, I mostly just want an affordable roof over my head. As beautiful as arches are, and as fascinating as it is to make them, they no longer serve as structural features in buildings. Where arches are used, they are merely decorative rather than functional. Load -bearing is handled by modern materials in modern configurations. We might mourn the loss of the arch, but no one is arguing that we stop using steel beams or prestressed concrete and go back to using them as functional features of our buildings. Idea on the value of arches in structures is pretty much irrelevant. Some critics of what they call "Buddhist Modernism" complain that the values being promulgated by Western Buddhists are just modern liberal values masquerading as Buddhism. I suppose, to some extent, this is true, but what is the alternative? Look around at societies in which Buddhism is the dominant religion. Look at their values. Most are nominally democracies, but until very recently most have also been dictatorships, very often military dictatorships. Most have been engaged in civil wars recently; many in wars with other nations. Democracy and human rights are not so much embraced by nominally Buddhist nations, as they are imposed on them by external, secular influences (one of the main ones being the cultural imperialism of the USA). Here in the West we now take liberal values—such as democracy and human rights—for granted. A couple of weeks ago, 68% or around two-thirds of eligible voters turned out for an election in the UK and this figure was considered "high". A third of the electorate not voting is outrageous when you consider what people went through to get the right to vote in this country! Ironically, traditional Buddhism, unmolested by modernism, might never have produced the kind of liberal values that we hold dear, if traditional Buddhist countries are anything to go by. Traditional Buddhists are likely be fatalistic about their lot in life, about the unfairness of the system, and about who is in power. As often as Buddhist monks protest oppression, they are the oppressors. If Japan had won the Pacific War, for example, and subjugated Asia and the USA, leaving the Germans a free hand in Europe and Africa, would we expect to have the UN declaration of human rights? History makes it fairly clear that the authoritarian, imperialist, militaristic government of nominally Buddhist Japan, with support from Buddhist clergy, was not heading in that direction. Communist China was brutal in Tibet, but it would have been much worse if Buddhist Japan had completed their conquest of Asia (which had begun some years before WWII). So, yes, we Western Buddhists have created a Buddhism that is consistent with our liberal values. But to be fair, we have created it from an idealised version of morality as found in Buddhist scripture, not from the historical values of Buddhist societies. Critics can be grateful for that, because in most Buddhist regimes, critics are not tolerated! We Western Buddhists may be religious, but we're not idiots. To argue that this is a form of modernism rather than a form of Buddhism is to ignore the highly eclectic intellectual history of Buddhism. The critique of Buddhism seems itself to be motivated by Protestant ideas about what a religion ought to be like. Sometimes I think it is ironic that my friend David Chapman touts a modernist version of tantric Buddhism, itself a syncretistic amalgam of various elements of medieval Indian and indigenous Tibetan religion, as a better "alternative" to what he calls 'consensus Buddhism'. On the other hand, he is probably right that embracing the hedonistic tendency of the West is more likely to be successful than the suppression of it required by renunciation-focussed forms of Buddhism. Puritanism still has its appeal to many Europeans (especially in the colonies they founded to allow Protestants to follow their religious ideology unmolested), but it's never been a realistic alternative to the way of life most people prefer. The Protestant trend in religious critique, combined with simplistic readings of Foucault and others on the idea of power and society, has made Westerners overly suspicious of community. Indeed, it seems to be de rigueur for critics of modern Buddhism to define the social aspects of Buddhism as not Buddhism. Modernists' Buddhism is sometimes narrowly defined in terms of a few elite practitioners with on-going non-symbolic experiences. Which excludes 99% of Buddhists from the category of "Buddhist". Pop psychology buzz-words like "group-think" or "echo chamber" seem to be over-worked at the expense of any attempt to understand humans as social animals. Still, I think Buddhists embracing Protestant attitudes is probably neutral. At least, in Protestantism, fatalism is undermined by the imperative to actually do something about one's faith, something sorely lacking in traditional Buddhism. It is essential for any modern critic to acknowledge that human beings are social and hierarchical by nature (which is, incidentally, why I am a socialist and not an anarchist). The same is true for all social mammals and many social birds, as well. Yes, some social situations are open to exploitation by sociopaths, but a human set apart from society, alienated from society, is far more vulnerable than one in a group. Isolation is cruel and unusual punishment for a reason. Alienated individuals are prone to addiction and mental illness. Foucault's notions of power embrace the role of the subject in hierarchical relationships. As social animals we instinctively subject ourselves to the group norms in a trade off for the protection and other benefits that community membership (ideally) provides. Some of the happiest people in the USA live in strictly religious communities. Amongst the Amish, rigid social norms constrain the behaviour of individuals in ways that look oppressive to outsiders. However, an Amish knows that they can rely on their community to a much greater extent than any outsider can on theirs. And in most cultures, this tradeoff of conformity for a very high degree of support is the norm. It is ironic that in secular society, with all its freedoms, inequality is orders of magnitude greater, and so many people appear to have no support at all. The destruction of the union movement, for example, has decoupled employment rates from wages. Employment is at record highs in the UK, while wages have been falling in real terms for 10 years and continue to fall. Divided, we fall. The embracing of Romanticism and the rejection of science, however, seem positively detrimental to me. Of course, alpha-critic, David McMahan, highlights ways in which he thinks Buddhists have embraced science, but my observation is that the influence is tiny in practice. Those Buddhists who do embrace science are few, and have started to form breakaway movements, though it remains to be seen how well they can integrate the two. They often fail to make the corrective move away from ontological readings of Buddhism, leaving them attempting to reconcile the irreconcilable. Or else they throw out far too much in an attempt at reconciliation. More interesting are those who have some ongoing non-symbolic experience and have either modified or largely abandoned the tradition to focus on just the elements that appear to directly contribute to non-symbolic experiences. This exacerbates the old tension (I almost said, the old injury) already mentioned, in which the social and cultural aspects of Buddhism are devalued in favour of isolated people doing specific meditative techniques. One of my friends characterises this as the distinction between Buddhism and the Dharma. Some movements are teaching people how to be Buddhists; others are solely focussed on creating non-symbolic experiences. I think we need both. If a Buddhist group is only teaching people how to act like Buddhists (which, of course, may include a regular meditation practice) then they would seem to be guilty of the complaint often laid at the door of secular mindfulness teachers: i.e., that their program is incomplete. On the other hand, a group that only offers intensive meditation instruction, and no pastoral care or community support, also seems to be incomplete. On one side is the danger of fatalism, complacency, and formalism; while on the other the danger is solipsism, alienation, and delusions of grandeur. Is there a keystone waiting to be inserted? I'm not convinced there is one. I suspect this will be another case of steel beams making keystones irrelevant. The rejection of science is particularly problematic for Buddhism. It is true that the scientific project is incomplete. There is a great deal that is not understood. And it is problematic that so much of science is dominated by reductionist ideology, which ignores structure and emergent properties. This seems to be changing. It's mainly physicists and neuroscientists who are obsessed with reductionism. A lot of other branches of science, such as biology, AI, or cosmology, understand that anti-reductionism is required where structures and systems are concerned. Chemistry is somewhere in the middle. We chemists know that everything is made of atoms, but that the really interesting objects are molecules and macromolecules, because they have properties and variety that are not found in atoms. No one designing a semiconductor or superconductor can afford an ideological commitment to reductionism, because the very properties that they investigate are systemic and emergent. Imagine if an architect only ever studied bricks and thought houses (let alone mortar) were not relevant because, being composite, they are not real. That's where a lot of science is right now. On the other hand, it's also where Buddhist doctrine has been stuck for 2000 years or more. In the clash of Buddhism and modernity, Buddhism stands to lose unless Western civilisation collapses and we go back to medieval or earlier forms of knowledge. I suspect that, in fact, the tipping point has been reached and traditional Buddhism has peaked. Buddhism as a religion is going to be gradually eclipsed by recycled secular presentations of our best ideas (few) and practices (many). However, if we cede the domain of reality to science we gain in two ways. We are still the experts in understanding the world of experience (for now) and we are seen not to insist on the kinds of obviously false claims about reality that religieux typically make. Sangharakshita studiously ignored science, technology, engineering, and mathematics (STEM) throughout his long teaching career despite the advances that occurred during his career, including the discovery of DNA, the integrated circuit, space flight, personal computers, organ transplants, brain surgery, and so on. None of this ever seems to attract his attention. Even when he spoke about evolution (a 19th Century theory) in the 1960s, rather than citing Darwin, Sangharakshita innovated a teleological and vitalist approach to evolution that was completely out of touch, not to say at odds, with the science of his own day (let alone the science of our day). Sangharakshita's layered approach to "reality" under the rubric of niyāma (an unfortunate misnomer that considerable effort from scholars of Pāḷi in the Order has been unable to shift), recently reiterated and elaborated on by Subhuti, incorporates elements of the 19th Century Western thought of Comte and Mill, via the Edwardian figure of Caroline Rhys Davids. However, again, Sangharakshita incorporates no insights from the STEM fields, but simply reiterates his vitalist teleology. I know I find this frustrating and I'm sure many of my STEM educated friends and colleague do also. I seldom make the challenge direct and personal, but I think this time I have to. The idea of a value-neutral, mind-independent world eviscerates Romanticism. My whole approach is anti-Romantic. And it is a considered stance that I believe is necessary, however confrontational it appears (my motivation is not to provoke confrontation, it is to rescue Buddhism from obscurity). While any influence is unconscious, it is potentially pernicious. This seems to me to be consistent with the early Buddhist criticism of dṛṣṭi or "views". On the other hand, I have never articulated a theory of aesthetics. Art and music do affect our states of mind. And, if we are in pursuit of altered states of mind, then, for this reason, aesthetics are important. The lack of an articulated approach to aesthetics is something I ought to address at some point (art and music have been important to me most of my life). In an environment in which aesthetics has become synonymous with Romanticism, what would an anti-Romantic aesthetic even look like? But if I have failed to engage with aesthetics, then I'm in good company, because neither has any other critic of traditional Buddhism. A major remaining problem for modern Buddhism is the supernatural. I no longer find anything about the supernatural plausible - it is not required in a value-neutral, mind-independent world. But virtually all religious, and even some non-religious, people do. Many intelligent people are willing to remain, or insist on remaining, agnostic on this matter. I know that many of my Buddhist colleagues and acquaintances are fully committed to supernatural interpretations of experience and structure their self-views around supernatural narratives. The supernatural is a fact to many people and likely to remain plausible to them for reasons I have previously explored on this blog. I find the evolutionary accounts produced by scholars such as Justin Barrett, Thomas Metzinger, Robin Dunbar, and Stewart Guthrie compelling. However, if their accounts are accurate, then factual arguments will most likely never convince believers that they are wrong. The supernatural will remain plausible and will be impossible to eradicate from religion. It will continue to form the core of religion, but it also informs people's views about the world far beyond the religious sphere. Unfortunately, the supernatural involves built-in falsehood, and it can only hinder any attempt to free ourselves from harmful views. Meanwhile, our methods and insights are being repackaged even now and represented in secular terms that appeal to a growing number of people who are not otherwise interested in religion, let alone an exotic minority religion like Buddhism. I suspect that at some point Western Buddhism will split into two broad factions over the issue of the supernatural. If this happens then a lot that is good about the tradition in terms of stories, myths, art, and so on, will be lost. I say this because I think that Buddhism, as presented to Westerners, is not sufficiently in tune with Western Values to ever be anything but exotic, with appeal to a tiny minority. As much as critics complain about the presentation of Western liberal values as Buddhist morality, in fact, many Buddhists are scornful and dismissive towards Western values. Politics (and with it concepts like freedom and liberty) and STEM are seen as outside the scope of valid knowledge. And the view seems to be that once one is enlightened one's values will be radically altered to be consistent with the sentiments of the English Romantic Poets (a bunch of degenerate freeloaders who spent a lot of time getting out of their skulls on opium). Since science and technology more or less define our modern values, any religion which eschews them or demonises them, as Buddhists tend to, will not grow beyond the 1% that we have attracted to date. And we will watch in frustration as other supernatural narratives, particularly God's love, divine forgiveness, and everlasting life, continue to outperform ours. It's a lot of hard work for quite meagre returns, and not really sustainable. Of course, a diaspora who have nothing left but their deeply religious culture will probably keep the traditions alive for centuries. Judaism shows just how powerful cultural identity can be under extreme adverse conditions. In this longish essay I've outlined a view of the world that I think provides maximum compatibility between contemporary knowledge of the world and Buddhism. It requires a considerable compromise on our part. In this last part I've tried to make it clear, using the imagery of arch building, that the task is not simply finding the right "keystone" that will allow science and Buddhism to map onto each other. In fact, I think it far more likely that science will simply bypass traditional Buddhism and leave it behind as a curiosity or fetish for Asiaphiles. Instead, commodified, secular versions of our key approaches to experience will eclipse traditional Buddhism, making much of it irrelevant. All it lacks at present is a sense of communal values, though, of course, the very act of commodifying something strips it of much of its value; and the therapeutic model steers away from creating communities. I want to finish with a different metaphor. In his book on the canon of Western literature, curmudgeonly literary critic, Harold Bloom (The Western Canon), turns the tables on Freud. Freud had infamously diagnosed many of Shakespeare's characters with psychopathologies. Bloom was of the opinion that Shakespeare had the greater insight into the human psyche, and argued that Freud probably agreed with this, at least subconsciously. Freud was reputed to be obsessed with Shakespeare. Where Freud had diagnosed Hamlet as having an Oedipus Complex—a rather simplistic and gross reading of the character—Bloom turns it around and diagnoses Freud as having a Hamlet Complex as a result of his feeling that Shakespeare had the deeper insight. However plausible we find this characterisation, the idea of a Hamlet complex is one I find useful in considering many things in life, but particularly the potential fate of Buddhism. Hamlet discovers from his father's ghost that his uncle Claudius, at his mother's bidding, has murdered his father and usurped the throne of Denmark. The testimony of a ghost would not stand up in court, but the knowledge compels him to act. He knows his mother, Gertrude, is complicit, so to confront his uncle is also to condemn his mother which he recoils from. For a while he feigns madness, or perhaps is a little mad, and during this period rebuffs his childhood friend and sweetheart, Ophelia. Things go from bad to worse when he inadvertently kills Ophelia's father, Polonius. Ophelia is so distraught from Hamlet's rejection and Polonius's death that she kills herself. There seems to be no course of action or inaction Hamlet can take to relieve the unbearable tension of his knowledge. Hamlet's attempt to expose Claudius using the play-within-a-play only alerts Claudius to Hamlet's awareness of his crime. Claudius plots to kill Hamlet, resulting instead in the deaths of his friends Rosencrantz and Guildenstern. In the end, events overrun Hamlet as Ophelia's brother Laertes returns and, prompted by Claudius, accuses Hamlet of responsibility for her death. Laertes challenges Hamlet to a duel. At the duel Claudius offers poisoned wine to Hamlet, but Gertrude drinks it instead and dies. But not before Laertes cuts Hamlet with a poisoned blade supplied by Claudius, sealing his doom. Hamlet's dying act is to stab Claudius with his sword, a final act of justice. To me, Buddhism has a Hamlet Complex. I think deep down we all know that the world has changed and, indeed, is changing rapidly around us. I suppose we might go down the route of the Amish. We might reject the modern world, get off the internet, stop using electricity, motor-vehicles, and modern medicine; we might give up personal freedoms and adopt rigid social norms; and that might be a satisfying life. I've certainly dabbled in it, during, for example, my four month ordination retreat. But we'll never sell this as an ideal which modern Westerners can aspire to. So here we are. We know that God is dead and religion is dying. We know that fewer and fewer people are religious. And yet, we who are still religious stand by as some promote an identical program but call it something else, and some pick out parts of our program and commodify it. We have good PR to an extent that we don't deserve, but we can't seem to capitalise on it, because we are promoting the one thing that no one wants any more. And yet,with some adjustments we could make it interesting to everyone. On Twitter this week, David Chapman asked what Buddhists offer the world. We offer a vision of human potential; a practical path for realising that potential; and a community of people who want more from life than mindless consumerism and blind obedience to the dictates of commerce. These are our gifts (ratna) to the world. If we were more aware of the limitations of these gifts (particularly the powerful constraints on who can achieve their potential) and of what we don't offer (an ontology; politics), then I think we would be in a stronger position. Perhaps we can boil it down to the idea that, at our best, Buddhists offer a way for people to experience a powerful sense of interconnectedness; something they crave, but which modern life does not provide. Let's not allow ideology to get in the way of giving our gifts with an open hand.